In the last month’s Atlassian Labs has introduced several new Bamboo add-ons to help monitoring your builds and pinpointing bottle necks in your build farm. We’ve installed and reviewed three of the most interesting ones for build managers. These add-ons allow you to identify bottlenecks and optimizing performance. The first one to discuss is “Build Times”. This add-on was available for older instances but support for Bamboo 5.10+ has been added recently. The add-on automates the effort of going manually through the log file and writing down the timings for each step. Results are taken from the log file and are represented in a graph together with the rest of the build information. It adds a “Build Times” tab to existing jobs showing not only build times but also queue time, queue, actual build and checkout times. It is very powerful, as it also allows end-users to identify why their job took so long. This plugin creates a graphical representation of Bamboo agents being active over time. After installing the plugin the administrator is left with the task to identify which agents are idling and which are working overtime. The add-on will analyze the build log file and creates a timing graph representing each build step. The add-on shows a list of all the agents and the time they are in use, which allows you to quickly pinpointing bottlenecks. Adding or removing capabilities to an agent can solve possible bottlenecks where multiple builds are limited to a single agent and cause queuing. Build managers who are responsible for a build farm with a large amount of agents already know the problem. Agents go off-line for various amount of reasons which only become apparent after a long period. The symptoms are usually hanging jobs or a slowdown of build throughput. 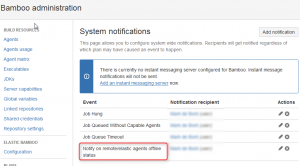 With this add-on you can add e-mail notifications so you will be immediately informed when build agents going offline. This way you can quickly respond on any agent problems so users are less affected by agent outages.